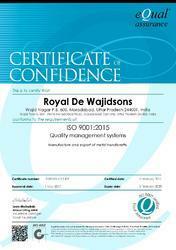 We are proud to be AN ISO 9001:2008 & Socially Compliant ORGANIZATION. Stringently tried and tested for quality, our products meet international standards. Our sophisticated testing unit is equipped to assist our qualified quality controllers to conduct various stringent quality checks. The complete production process is monitored at every stage to ensure premium quality. The quality check is done right from the stage the raw material which is sourced from finest quarters of the country. Our focus on complete quality has led to our superior rating with clients. Being a socially responsible organization, we always lay emphasis on the quality of our offered products. These are stringently tested on defined parameters of quality in order to ensure their compliance with the international standards of quality. We have set up a sophisticated testing unit, which is well equipped to assist our quality experts, who conduct different quality checks on our range of products. They strictly monitor the bulk goods through the entire production process so as to ensure that the end products match the expectations of our customers. Our complete focus on quality has helped us get repeated orders from our customers based all around the globe. We are a client centric organization and our aim and objectives are geared to ensure maximum client satisfaction. If you ask us to design the impossible, we will make it possible. 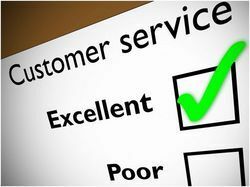 If you want quality, we will exceed your expectations. We completely meet the national and global requirements of local and international stores. From production to delivery, every effort is made to give superior service.